The SMU Career Volunteers program represents a collaborative effort between alumni, students, the Office of Alumni Engagement, and the Hegi Family Career Development Center. 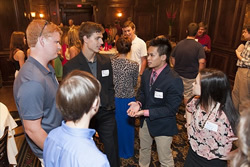 SMU students are anxious to make connections with alumni as they look to jumpstart their career. Alumni volunteers are needed to share their experience, insight and expertise with students and encourage them to utilize their Mustang connections around the world. Participate in a one-day externship during the student’s winter break. Similar to job shadowing. Serve as a general career resource for students. Time commitment varies depending on student participation, your location, and the number of opportunities in which you enroll. All submitted resumes will be passed on to alumni, who will contact the student or alum. Joining is easy! Just fill out our interest form and choose SMU Career Volunteers as your volunteer role of interest. Once your form is submitted, a member of the Office of Alumni Engagement team will be in touch with you to discuss the next steps! Join SMU Career Vounteers Today!